collectSPACE - news - "Titov, second to orbit Earth, dies"
September 21, 2000 — It is with sadness that we note the passing of cosmonaut Gherman Stepanovich Titov, the second human to orbit the Earth. Cause of death was determined to be heart disease, contrary to intial reports of carbon monoxide poisoning. Titov was 65. Gherman Titov became the second human being to make an orbital spaceflight when he spent a record 24 hours in orbit aboard Vostok 2 in August 1961. With 5 weeks to go until his twenty-sixth birthday, Titov remains the youngest person to go into space. Titov's flight, following, as it did, a single orbit by Yuri Gagarin and two suborbital flights by Americans Shepard and Grissom, was an electrifying world event, with the progress of the Vostok 2 reported hourly as it passed over the globe. Using his exuberant call sign -- "Ya Orel!" or "This is Eagle!" -- Titov was seen and heard on television, giving viewers a tour of his spacecraft and describing the sights he saw through his window. What was not revealed at the time was that Titov was the first human to suffer from space adaptation syndrome -- space sickness. He was hospitalized for a time following his flight and never made another spaceflight. Titov was born on September 11, 1935, in the village of Verkhneye Zhilino, Kosikhinsky District, Altai Territory, Russia. His father was a schoolteacher and gave his son the name Gherman (Herman, unusual for a Russian) to honor his favorite Pushkin character. Young Gherman decided he wanted to become a pilot when his uncle, an aviator and war hero, paid the village a visit. Titov entered the 9th Military Air School in Kustanai, Kazakhstan, in July 1953, transferring to the Stalingrad Higher Air Force School 2 years later. Following qualificaiton as a pilot in September 1957 he was a pilot in two different Air Guards regiments of the 41st Air Division, Leningrad military district. One of the first 20 Soviet cosmonauts selected in March 1960, Titov came close to washing out, most notably when he rebelled at what he called "silly questions" during psychological testing. In March 1961, after a year of training, Titov was one of 6 finalists for the first manned flight. On the morning of April 12, 1961, Senior Lieutenant Titov, dressed in his orange pressure suit and space helmet, accompanied Yuri Gagarin to the launchpad at the Baikonur cosmodrome. Gagarin went aboard the Vostok spacecraft and Titov, his standby, returned to the cosmonaut quarters to wait for the launch. Shortly after Gagarin returned to Earth, Titov learned that he had been selected to make the next Soviet spaceflight, then planned to be three orbits. The proposed duration was later lengthened to 17 orbits, or a full day. Following his flight Titov attended the Zhukovsky Air Force Engineering Academy with other cosmonauts, graduating in 1968, and joined the editorial board of Aviatsiya i Kosmonavtika (Aviation and Spaceflight). For many years in the late 1960s he was the most visible of the Soviet cosmonauts, frequently interviewed by Western journalists and contributor to many Soviet and Western publications. In 1967 Titov attended the Chkalov test pilot school under the instruction of aviator Vladimir Ilyushin. At the time Titov had logged 800 hours of flying time. He received a rating of test pilot third class and did some test piloting at the Chkalov military flight test center in addition to his work at the cosmonaut training center on the Spiral spaceplane program. 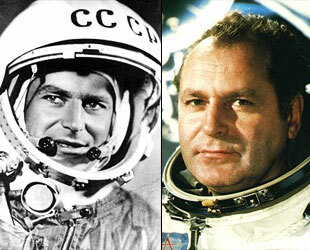 The death of Yuri Gagarin in March 1968 caused the cautious heads of the cosmonaut training center to ground Titov. Frustrated by his inability to serve as an active pilot, Titov left the cosmonaut team in July 1970 to attend the K. E. Voroshilov Military Staff Academy. He graduated with a candidate of military sciences degree in 1972. He joined the Main Office for Space Facilities (GUKOS) of Soviet Ministry of Defense, serving as deputy director of that organization's command and control center (KIK) in Monino. At KIK Titov was involved in the ground control of the military's Salyut 3 mission in 1974. From 1973 to 1979 he was deputy commander of GUKOS for research and development, directing the development and construction of several spacecraft systems, including launch vehicles. He was promoted to lieutenant general in 1979, and named first deputy director of GUKOS, later UNKS. He received a candidate of technical sciences degree in 1981 and also served as a member of the committee for the 1980 Moscow Olympics. Colonel General Titov retired in October 1991 to become president of the Kosmoflot Scientific-Technical Center. He later served as vice president of the Russian Center for the Conversation of Aerospace Complexes. In May 1995 he was elected to the Russian parliament from the city of Kolommna, near Moscow. He is the author of several books, including A Million Miles in Orbit (1961), My Blue Planet (1977), Conversations with Cosmonauts of the USSR (1983), and On Starry and Earthly Orbits (1987). In addition, his autobiography, as told to journalists Wilfred Burchett and Anthony Purdy and written by Martin Caidin, was published as I Am Eagle! (1962). The preceding biography was reprinted from Who's Who in Space, International Space Station Edition by Michael Cassutt. Copyright © 2000, 1999, 1993, 1987 by Michael Cassutt. It is used with permission of the author.